Postojna Cave, the cradle of speleobiology, is home to approximately 100 different animal species, none quite as famous as the olm (Proteus anguinus) AKA “the human fish”. This peculiar animal lives inside the cave in the Pivka River, hidden from the watchful eyes of tourists, but some specimens are kept in an aquarium as part of the cave tour. In this very aquarium, an exceptional scenario is currently unfolding and it is a sight to behold. 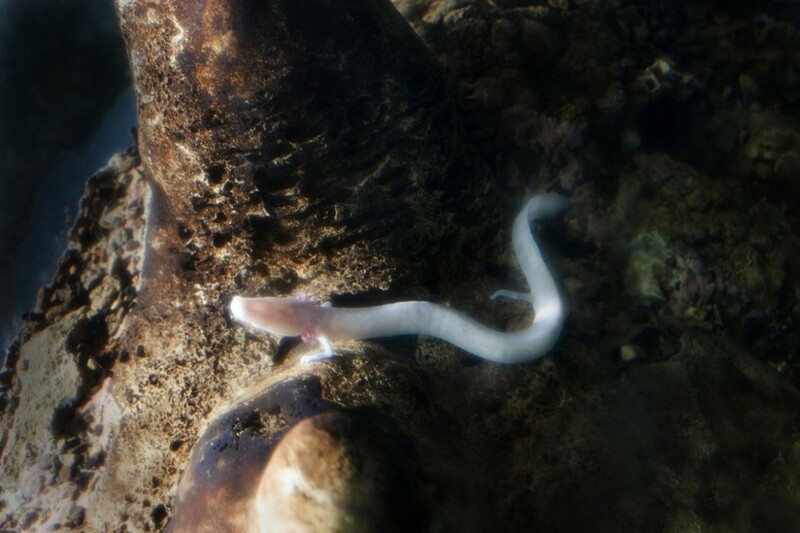 Earlier this year, on 30th January, a female olm started laying eggs and has produced approximately 60 so far. 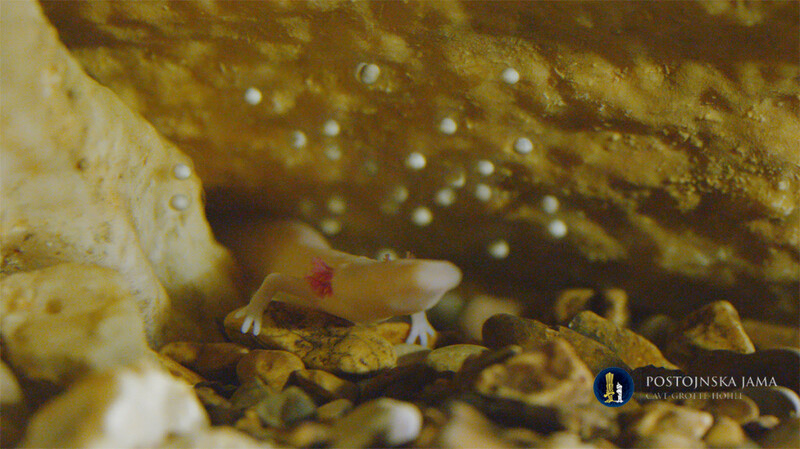 This is the second time in history that we are witnessing the olm’s reproduction process in a show cave (it happened in 2013 in the same cave) and, with a bit of luck, we might be welcoming baby olms into this world sometime in June. Immediately after the first eggs were laid, the other olms were removed from the aquarium in order to provide the female with peace and quiet. 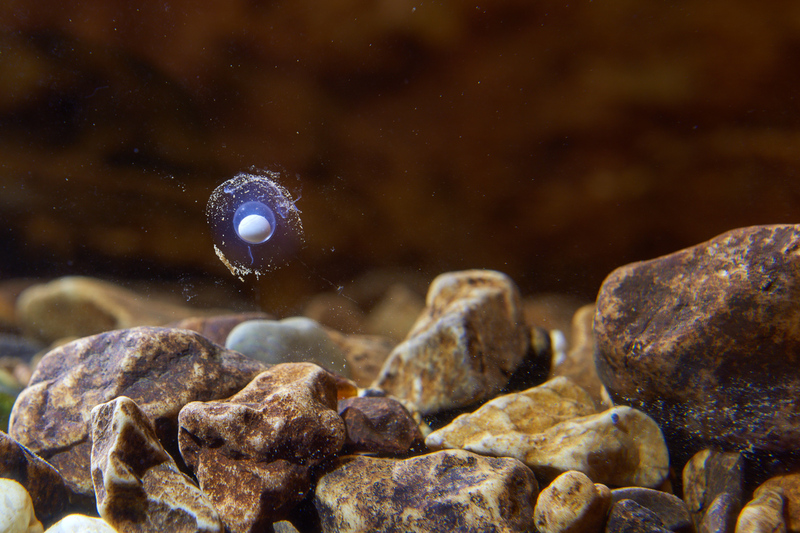 However, the aquarium is also home to tiny cave-dwelling amphipods, which want to make a snack of the eggs. Observing the watchful mother olm protecting and caring for its eggs is fascinating, and it also gives us an interesting insight into the life cycle of this enigmatic animal. This curious amphibian has baffled scientists since the very first live specimens were retrieved in 1768 and, after almost 250 years of research, many of the animal’s mysteries are still left unexplained. Interestingly, the olm was initially not classified as a cave animal. This honour was reserved for the slenderneck beetle (Leptodirus hochenwartii) in 1831, which proved that animals could actually survive in such a hostile environment. Prior to that revelation, however, uneducated and superstitious farmers who spotted the olms, as they were flushed to the surface after heavy rain, were not able to rationally explain what they saw and had to rely on their imagination; they were certain they had come across baby dragons and were terrified at the prospect of a big momma dragon living in one of the caves. Thus, the legend of the Postojna Cave dragon was born. A popular folk tale describes a huge fire-breathing beast with a mighty roar and an insatiable appetite. To keep the dragon quiet and satisfied farmers had to sacrifice their calves and lambs and throw them into the cave. 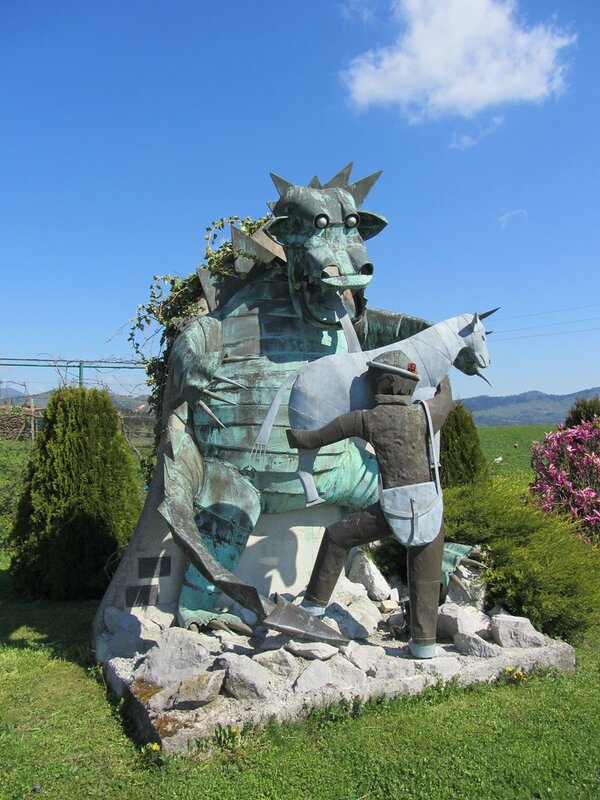 Fortunately for the locals, a brave little shepherd boy called Jakob outsmarted the dragon by stuffing a dead calf with quicklime and throwing it to the dragon which swallowed it whole. Thirsty after its meal, the dragon drank out of the Pivka River, but the water combined with the quicklime produced a violent reaction, causing the dragon’s belly to explode. As a sign of gratitude, the people of Postojna fashioned a leather bag for Jakob out of the dragon’s skin, earning them the nickname “torbarji” (bag makers). We have since come a long way in understating the fragile olm. Its dragon impersonating days are over and we are now fortunate enough to get a rare glimpse into the most intimate and vulnerable period of its life. We are all keeping our fingers crossed for the baby olms to hatch, as this might provide us with a new insight into the life of this mysterious animal. However, when it comes to fully understanding this unusual being, we will probably be left wandering in the dark for years to come. Tagged animals, cave, Karst region, legend, river. Bookmark the permalink.